If you were to ask what my 'you're super duper tired and more than a little tipsy'-cleansing routine is, there's a big chance I'd say micellar water and some moisturizer. And I'm betting this routine comes up with completely sober ladies as well. Because let's face it (pun intended), toning is probably the most neglected step in skincare routines, and that's a shame. Toning your skin is important for a myriad of reasons. The liquid that comes after cleansing can remove dead skin cells, remove excess oils and it can help the products applied after penetrate more effectively. 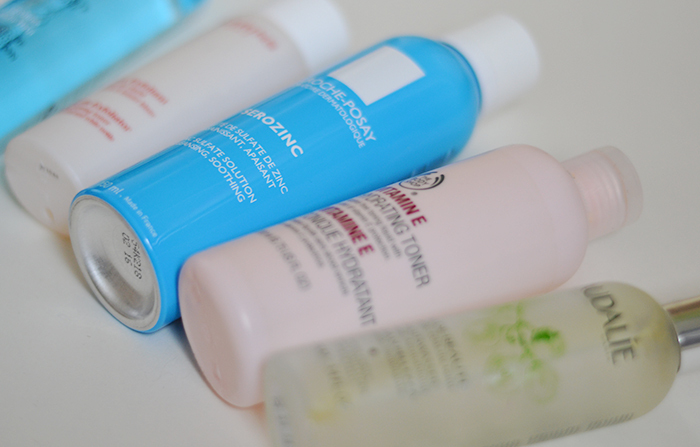 Toners balance your skin. Cleansing, no matter how gentle the product you use, will adjust the ph-value of your skin. A toner can help your skin regain it's natural balance much quicker.There are so many different toners, and I put together a little edit of different toners that all do an amazing job. 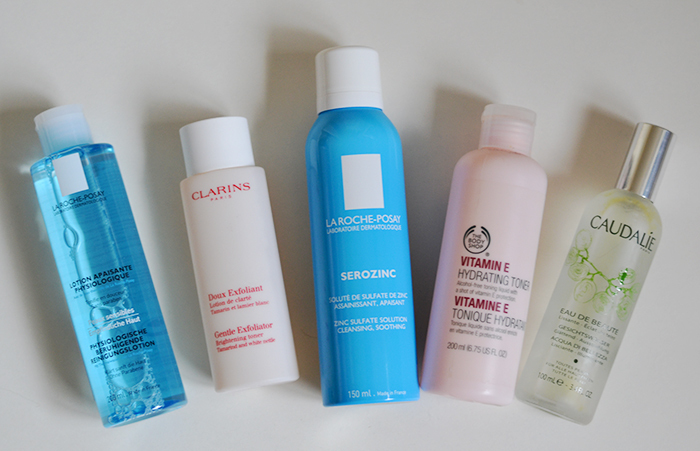 La Roche Posay is probably my favorite skincare brands out there. This may or may not have something to do with crisp clean packaging, but the effect of their products certainly do not dissapoint. The physiological lotion does a really good job at leaving the skin fresh and balanced. While Serozinc is the more hydrating of the two. It soothes irritations on the surface and it acts as a humectant. That's a fancy word for something that attracts moisture from the air and traps it between the top layers of the skin. Shamefully, this wonderful product is very difficult to get a hold of outside of France. Staying on the topic of hydration, because let's face it, dehydration is the most common skin problem. A product that smells really good and infuses the skin with moisture is The Body Shop Vitamin E Hydrating Toner. This doesn't have the same consistency as other toners. It's a little thicker, like a watered down moisturizer. It leaves the skin feeling hydrated, and you can totally see the glow on your skin after using this. Another French-y is the Caudalie Beauty Elixir. It comes in a spray bottle, which speeds up the toning process. Ideal for those lazy lasses out there. But besides that it also calms redness, shrinks spots, invigorates the skin with moisture and leaves you looking radiant. Focusing on a different, but equally important part of skincare is exfoliation. A really important part because removing dead skin cells clears the room for new ones. New fresh skin is the best. Soft and fresh and looking like you had an excellent night of sleep. And isn't that what we all want? The product to use for that is the Clarins Gentle Exfoliator. A bit higher in price, but so worth it. This has really changed my skin for the better. Because this is an acid based toner this takes your skin more to the acidic side of the ph-scale. An acidic skin doesn't allow bacteria to grow into spots. Another plus. I hope this has opened the eyes of some of the non-toner using crowd out there. Use toner girls, it's just a swipe or spritz. Shouldn't take more than thirty seconds. And we can all get thirty seconds, can't we?